The Portmeirion Weekend in November has becoming an established event in the calendar for folder enthusiasts. The 1999 event was once again a great success, as these reports show. 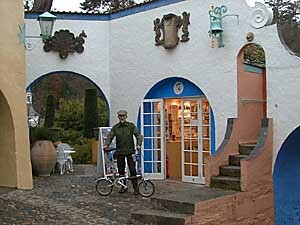 We took a digital camera and Psion Series 5mx computer to Portmeirion, and were able to load photographs and reports of our activities onto our web pages each evening during the week. These original daily reports are still available: if you wish to see them - use the links below. This year the annual Portmeirion meeting was a few days later than previously, starting on Monday 29 November and finishing on Friday 3 December. As in the past, a couple of dozen members and their cycles took advantage of this opportunity for an autumn/winter break, including one from the USA. By my reckoning we had 4 Bike Fridays, 3 Birdys, 3 Brompton SPs, 1 Bickerton, 1 Panasonic Traincle, 1 (motorised) Micro, a demountable Longstaff tricycle, and the rest were on normal Bromptons. Most people made the journey down to Portmeirion by train, arriving by stages throughout Monday. Probably the largest single group was that which arrived on a rather delayed train which left Birmingham New Street in theory at 10.20am, but in practice about 30 minutes later than this: By the time it arrived at Penrhyndeudraeth there were 8 of us on the train. As Alan Foreman had the tricycle on this train, there was a good deal of excitement during the change at Machynlleth, where the train staff were unhappy about allowing it on the train (tandems and tricycles are not allowed according to Central Trains rules). Happily we got Alan and the trike on in the end, with the assistance of a member of the station staff who carried it from the one part of the train to the other (see photograph). One drawback of taking a holiday at this time of year is that it gets dark so early in the afternoons, and by the time we arrived on Monday it was too dark to do anything other than buy food etc for the evening meal. 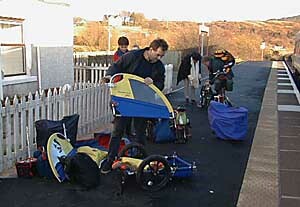 Much activity at Penrhyndeudraeth as the bicycles, tricycle and Alexander Henshaw's trailer are reassembled. Monday had been a beautiful day in weather terms for this attractive journey down, but although Tuesday was much greyer and windier, there was no rain. Most people used the day to recover from their the journey, but Michelle Whitworth, Derek Carpenter and myself rode over to Criccieth, Llanystumdwy (where the bikes and riders are pictured by the Lloyd George Memorial) and then along some very pleasant lanes to return to Porthmadog via the A487. It was certainly hard work riding into the wind on the way out, but of course much easier on the way back, and the descent into Tremadog was particularly enjoyable. Paul Stobbs on the Panasonic Traincle apparently followed a somewhat similar route later in the day, but using one very minor road which we had not been along he collected two slow punctures, one front and one back. As the Traincle uses lightweight plastic tubes in its 12 inch tyres, and these will not accept normal patches, this was quite a problem. Paul had a spare conventional tube with him, and this was fitted to the rear in the evening, and we tried a glueless patch on the other tube, but this was not very satisfactory as it seemed to leak except at quite low pressure. 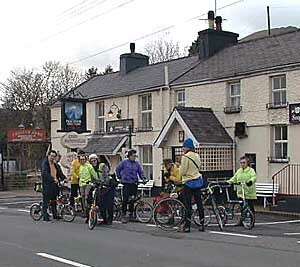 On Tuesday evening we made a tentative plan for a ride, weather permitting, to Caernarfon on Wednesday, going there via the road, and returning most of the way along a cycle path. Happily the weather was good, with sun, much less wind than the previous day, but still remarkably warm. In the end 10 of us went on this ride, although two of these joined as the ride progressed - Paul Stobbs having made an early trip to a cycle shop in search of a tube for the Panasonic, and Philippa Wheeler using her motor on the Micro first to catch us up a few miles into the ride, and then to go on ahead on the way to Beddgelert so that she could photograph us. 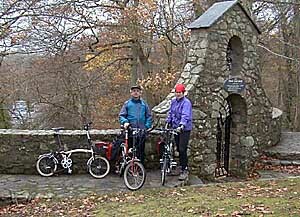 After Beddgelert, where some of the riders are pictured at a refreshment stop (see photograph), she reverted to pedal power. From Beddgelert there was quite a steady climb, but fortunately nothing too steep, and this quiet A road had some excellent views as we made our way to Caernarfon for our lunch stop. By then we were becoming concerned about the time and how soon it would get dark, particularly as some people were not very well equipped with lights, so this was quite a brief stop, and we set off without delay along the cycle path, which initially follows the Welsh Highland Railway. The surface of this is path is quite good - fortunately, as the tricycle was with us, but nevertheless Anna Finch's Bridy Green succumbed to a puncture, and as the first patch did not stick properly, a second halt had to be made. After this had been repaired the group pressed on quickly as the light was beginning to fade, and in the end we returned as two groups. The bikes used for this ride, which totalled about 47 miles, were 3 Brompton SPs, 2 Bike Fridays, 1 standard Brompton, 1 Birdy, the Panasonic Traincle, the Micro and the Longstaff tricycle. 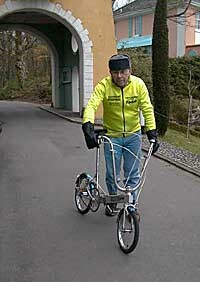 The main activity on Thursday was bike testing, and of course the main attraction was Paul Stobbs' Panasonic Traincle. 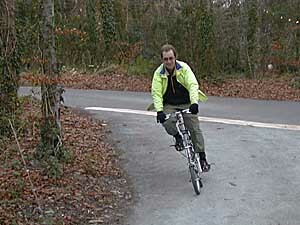 Our picture shows Peter Henshaw riding it at speed. A preliminary report on the Traincle appeared in Folding Society News number 42 (http://www.whooper.demon.co.uk/foldsoc/fsn/fsn042.html), and a more detailed review can be expected in the next issue of A to B. We will also be putting a copy of our report, with additional photographs, in the test section (http://www.whooper.demon.co.uk/foldsoc/tests.html) of this web site within a few days. Perhaps not surprisingly, the Bickerton, seen here with owner Mike Lenton, was less of an attraction. Derek Carpenter's load carrier was another attraction - and yes, it does separate, though only into two rather large pieces! 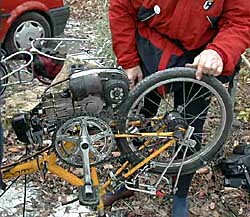 Philippa made the mistake of taking the motor off the Micro for people to try the bike, but of course everyone was more interested in it with the motor fitted, so she had to put it back on again! 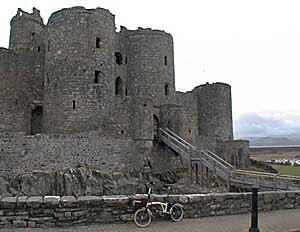 After the testing session, a few people went for short rides - my own took me to Harlech Castle - hard work riding into the wind on the way there, but very enjoyable on the way back. Although I was the only one on the first train from Minffordd (08.28), most people were on the next one, which meant that for most of us the majority of the day was spent on getting back home, and remembering what a good time we had had. 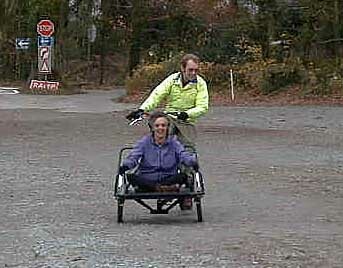 Many of the participants had been to one of the Portmeirion events before, which proves just how enjoyable they are. Nonetheless, there are now only three people who have been to all 4 of these events - David and Jane Henshaw and myself. Alexander Henshaw is the youngest person to attend yet, and seemed to enjoy himself. The refurbished Prisoner Shop at Portmeirion now has internet access, and we were able to check our web pages when we discovered this mid-week. For those who needed to do so, it also provided a means of checking email, although I did this myself using the Psion Series 5mx which I had taken down to prepare the web pages. Our picture shows Paul Stobbs and the Panasonic (star of the event) outside the shop. My own SP performed flawlessly, and proved ideal for this sort of event. It was folded and covered on both the outward and return journeys - normally I would not bother with the cover unless the train staff requested it, but when several folders may be on the train, it seems wise to conform to the rules; in the end mine was the only folder on this particular train on the return journey. The distance I rode over the 5 days was 116.7 miles, bringing the SP mileage up to a total of 600.4. Over the four years I have taken 4 different folders to Portmeirion. The first year was a little different from the others, in that there were only 8 of us, all in the same house, and as a result we tended to go out as a group too. All the others had Bromptons, and I had a Bike Friday, and more time was spent folding than riding, which made the Friday something of a nightmare - it's OK on your own, or with other Fridayists, but with Bromptons it is very embarrassing. The second year I took a standard Brompton T5, but I did find it a bit constraining in terms of when I wanted to go on longer rides. 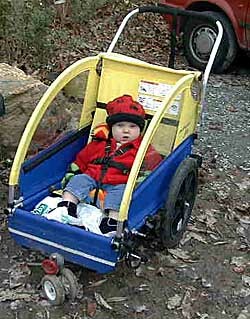 The Birdy I used last year was very successful, although not so good for luggage carrying as the SP this year. Overall, and ignoring the different conditions on the four occasions, I think the Birdy and SP have proved most successful for this type of outing, involving folding at the start and end, and for storing the bikes at night, with no need for much luggage and distances of only 50 - 120 miles being covered in the week. We wanted to be able to post daily reports and pictures on the web site, but without needing to take a lot of bulky and heavy equipment with us. While a digital camera did not present any real problems - we have been using a Nikon Coolpix 900 for over a year - the computer was more of a problem. Notebook computers are ideal from a computing point of view, having the ability to author the web pages in software like Frontpage, link in pictures from the camera, loading them onto the notebook either via the camera cable or by plugging the CF card directly into the notebook, and then transferring the pages and pictures to the web site using FTP software and a built-in modem. The problem was that even a Toshiba Portege 3110Ct is quite heavy, bulky and fragile when you are travelling by bicycle. I have used various palmtop computers for many years, including the Psion Series 5mx, but none has provided the necessary combination of modem connection, reading CF cards, editing web pages and transferring these pages and pictures via FTP. In mid-November, two FTP packages became available for the 5mx, and this solved the main problem. Although the screen of the Series 5mx is really rather small for this sort of work, and is mono, and there is no proper web page editing software, nor picture editing software, there was just enough to be able to attempt the job. Our final system was the Nikon Coolpix 900 camera with 12M CF card, Psion Series 5mx with PC card modem adapter, a US Robotics card modem, the RMRFTP software, RMRText - a very basic text editor which could be used to compose the HTML of the web pages, mains adapters and other leads. As we could not edit the photos that were being taken - not even to crop them - we used the camera in a low resolution VGA mode, although even that produced rather larger (or at any rate wider) pictures than we really wanted. Some pictures intended for other uses were shot in higher resolution. The pictures were viewed and suitable images selected using the cameras internal screen, and then the CF card was removed and plugged into the Psion and these picture files were copied into the Series 5, and the text of the web pages was typed in with the RMRText program, including links to the pictures. The Series 5 was then linked to the modem and the telephone in Government House, where we were staying, and the RMRFTP program was used to connect to the web page storage area, and the report and picture files were copied across. The chief difficulty was the limited screen size and its rather poor visibility, which made typos difficult to spot, and a few layout problems also occurred. Towards the end of our stay I discovered that the No 6 - Prisoner - shop at Portmeirion, which has been refurbished since our last visit, now has on-line computers connected to the internet. They are quite happy for visitors to use these to look at anything on the net, including their email. I was able to check the pages using this and correct a few errors which became apparent this way. Another time I could probably make more use of these computers to edit and check the pages and also upload them, which would be easier than trying to do everything via the Series 5. Overall though, the system worked and was quite easy to transport. I hope that those who did log on to read our daily reports enjoyed taking part in the event, if from a distance.